After two seasons of promotions from wsL 2 to wsl 1, I thought it would be a good idea to see if promoted teams do well or are struggling when they move up. They beat Liverpool, Bristol x2, Birmingham, Notts County, champions Chelsea. Bristol were relegated. The first nine games returned WLWLLWWWW and the last five games DDLLL. Sunderland struggled with injuries towards the end of the 2015 season. Their two wins were against promoted team Doncaster Belles who ended up relegated. Their only win was against Doncaster Belles who ended up relegated. They drew against Sunderland x2, Notts County x2 , Birmingham x2. Those six draws kind of kept them up as they lost on final day to the Belles, when things were already settled. 15 defeats in a row before a last day win a Reading Women, too little to late. Worse attack, worse defence in the League. It is quite obvious that the promoted teams have a tough time and struggle overall when moving to WSL 1. Sunderland in 2015 being the exception to the rule, this is probably due to their excellent defensive block positioned quite low on the pitch and clinical finisher in Beth Mead, who finished the League as top scorer that season. So why do those promoted teams struggle ? If we discount the succesful Sunderland 2015 season, in term of goals in 2016 : Doncaster 8, Reading 15, Sunderland 17. Note that Notts County scored 16 only and got 16 points while Birmingham scored 18 and got 27 points. Obviously Doncaster did not score enough goals . If we look at defences Doncaster conceded 48, Sunderland 41 and Reading 26. Notts County conceded 26 like Reading and scored only one more goals but got seven more points overall. Doncaster obviously did not have neough offensively and defensively, while Reading was in line with near mid-table teams on that respect. There is a huge jump in quality between FA WSL 2 and FA WSL 1 as most of the teams are not training full-time in FA WSL 2, while it is the opposite in FA WSL 1 . I believe only Doncaster and Reading did not have an entire squad doing full-time training with those two sides having full-time players and part-time players with a normal job activity. Reading having probably double the number of full-time players than Doncaster. As horrible as the FAWSL licensing criteria are ( I mean the football side is one of least important criteria), they certainly set a minimum standard for infrastructure and marketing that are needed in the top division. Unfortunately, it means selecting teams on money criteria rather than sporting criteria, which should the base criteria in any sport. What it means is Bristol and Yeovil will have to provide good enough facilities and support off the pitch to be able to compete on the pitch. We know that Bristol made the change towards that improvement when they moved from their Bristol Academy brand to become Bristol City Women. That back-up from the men’s club being crucial and of course their facilities as well as training full time this season means they are prepared for when they will get back to FA WSL 1 in September. Yeovil will discover the FA WSL 1 and there is a very interesting interview from the chairman Stephen Allinson in Sommerset live. “Manchester City are full-time and what I mean by that is they’re paid full-time and train five times a week. It’s not going to be possible to do that and of course most of our girls have other jobs. Yeovil’s success and promotion is the proof that smaller clubs can make it to the top division and hopefully will be able to stay up with a different business model than the clubs coming with the money straight from the coffers of a rich men’s team. There is nothing wrong with a men’s team giving a lot of oney and facilities to their women’s side, it does help raising the football level. Now, if all the teams had GPS and cryotherapy as an example among other facilites, that would certainly help smaller teams, along with good logistics and costs travel. On the footballing side alone, success for Sunderland in 2015 and relative success for Reading in 2016 were based on solid defending, being difficult to beat, the normal underdog modus operandi. Sunderland and Doncaster poor defending in 2016 with 41 and 48 goals shipped, shows that proper defending is priceless for teams trying to avoid relegation. Not many teams fighting for survival can allow themselves to play a proper expansive attacking game. It will be a tough ask for Bristol and Yeovil to stay up next season, they will need to recruit the right quality players in key positions and the right tactics as well as a lot of work done off the pitch. In order to bridge the time between the end of the 2016 season and the new 2017/18, the FA have created the Spring series to allow the England players to get sufficient match practice prior to the Euro 2017. From the information published so far, the FA WSL 1 spring series will run from the 22nd of April to the 3rd of June while the FA WSL 2 spring series will run from the 11th of February to the 20th of May. This is the 2017 calendar from January to August, the colour explanations are on the right side of the picture. FA WSL 1 and FA WSL 2 will run with 10 teams each with new promoted from the FA WPL Brighton involved in the series. The FA WSL 2 potential match dates are in purple and you can see that we can find nine week-ends for the nice games planned which is great, problem sorted. Then you look at the FA WSL 1 possible schedule and there are only seven week-ends available which means at least two midweek games. The FA are also banking on Manchester City not reaching the Champions League semi-finals that are played on Matchday 1 and probably matchday 2 of the FA WSL 1 spring series. At least Chelsea losing in Round 1 has eased the fixture congestion. So why is the program so congested ? Because the FA wants to have the England players as early as possible to prepare for the Euros. The official release date for the players in the 2nd of July. With no games later than the 3rd of June, you would expect the players to be released under the expected schedule on the 4th of June a month earlier than necessary. With the FIFA dates from the 5th to the 13th of JUne, the FA Could have played games on the 18th and 25th of June. That would have still given them an extra week more that the official FIFA regulations allow. The clubs have their hand tied on that matter (probably) although in theory ,they are not obliged to release the players. But who pays the England central contracts and gives at least £70,000 or £35,000 a year to the FA WSL clubs : the FA (of course). FA WPL sides could make a giantkilling or two in the FA Women’s Cup as FA WSL 2 teams are exempt until the third round proper one week before the spring series starts for them, while the FA WSL 1 team will enter on the fifth round proper a month before they start their spring series. 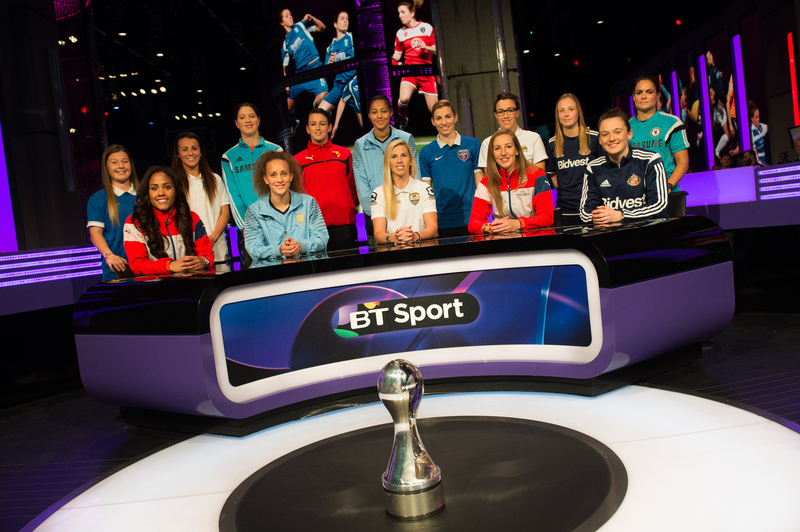 Putting the FA WSL teams at a disadvantage is good for the FA Women’s Cup competitivenes . 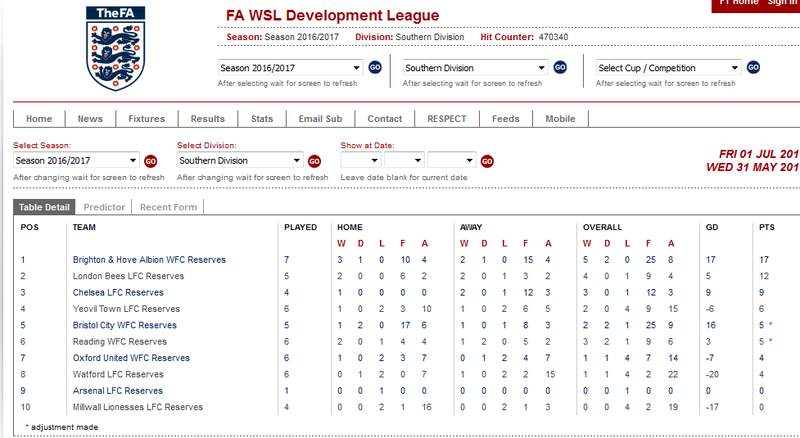 It will be interesting to see if the elite teams enter the 2017/18 competition in January like they used to do in the old FA WPL times(prior to the FA WSL inception). After all they will be in the winter season like everybody else and therefore won’t need the huge competitive advantage given to them in the past. So it already looks like a messy schedule for the first half on 2017. It is important to note that this tight schedule does not take into account match postponement. Who knows where the games would be placed if the weather comes into the equation ? Once UEFA has published their 2017/18 calendar dates, I will be back analysing the potential FA WSL 2017/18 schedule as FIFA as already set in stone the 2018 and 2019 women’s football calendar. As usual once the season is over, it is time to see if my pre-season predictions were hit or miss, I will review both WSL 1&2 predictions and how far I was from the final table. Wrong prediction on Arsenal (-2) positions, 50% right on Chelsea as I predicted position 1 or 2. Arsenal simply underperformed when you see the winter acquisition and the squad strength. Wrong again with City finishing first and unbeaten, I thought their samll squad would be their undoing. No one managed to get close to them besides Liverpool who drew twice against them and Birmingham on final day. Wrong again on Sunderland who underperformed compared to the previous. 50% right on Liverpool. Totally wrong on Doncaster who I expected to reach middle table safety very easily but ended up with 3 points and the worse ever FA WSL 1 record. Wrong again on Birmingham who defied expectations by finishing fourth. Credit to Dave Parker, Marcus Bignot and all the girls. 50% correct on Reading that I had place in 7th or 8th place. Wrong again as they finish way higher up the table in 6th place, obviously I underestimated a squad with 11+ internationals. Correct on Everton finishing third, Sheffield finishing fifth is kind of in range, and Millwall finished in eighth place following the mid-season internal problems and the change of manager. Watford bottom of the table was no real surprise and with a managerial change in the middle of the season, it did not help. London Bees finished in seventh place thanks to a great job from Dave Edmondson and the players. Here we are. We had 37 votes, with many people actually not chosing 11 players for some reasons, here is your best FA WSL 2 11 as voted by you the fans. The number of votes are in brackets and we will also have a bench with seven subs, the team is set in a 4-4-2 system as per the players who had the most votes by position. This is a good and balanced line-up, Yeovil have three players, Bristol, London Bees and Everton have two players, Sheffield and Durham have one player each. Overall 9 goalkeepers, 27 defenders, 28 midfielders and 15 forwards received some votes with 33 out of those 79 players receiving a single vote. It is the same principle as the best FA WSL 2 11, you can fill up to 11 names or less, there is no restriction on tactics: you can have 1 goalkeeper, 3 or 4 defenders, 3 4 or 5 midfieders, 2 or 3 forwards. You can therefore have a 4-4-2, 4-3-3, 3-5-2, or 3-4-3 system and best 11. The players names is enough although you can put the first name if there are multiple players with the same name in the League eg Alex Scott or Jill Scott.